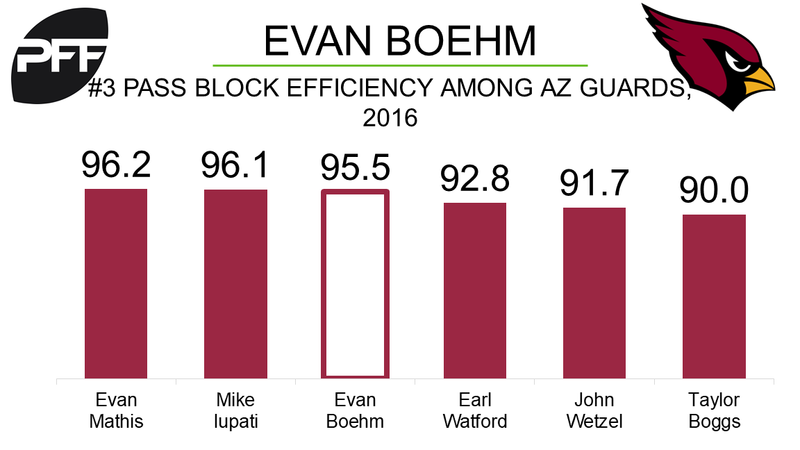 Bruce Arians and the Arizona Cardinals have confirmed that Evan Boehm will be the team’s starting right guard in 2017, according to Josh Weinfuss of ESPN. Injuries gave Boehm an opportunity to get on the field last season as a rookie, with 117 of his 122 total snaps coming in the final two weeks of the season as he stepped in to play right guard, and the other five earlier in the year as a stand in center for a play or two here and there. Boehm allowed four total pressures and was flagged once across those 122 snaps earning an overall PFF grade of 52.7, but the Cardinals will be hoping for more in his second year.